Due to customs and delivery problems, we no longer ship drums outside of the United States. A combination of the traditional North African tar and the tambourine, the Tar-Rine, designed by Layne Redmond, lends itself to many drum techniques from around the world. 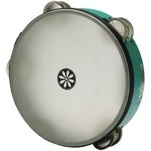 This frame drum can be held like a Tar or Riq, or played on the knee in sitting position. Features five sets of very light German silver jingles. It is larger in diameter (12 inches) than the Lotus or Riq. The Tar-Rine offers nearly unlimited rhythmic possibilities and a uniquely expressive, musical tone. It can be played with the fingers, the flat or your hand, with one hand or two – the possibilities are as vast as your imagination! Acousticon shell with pretuned fiberskyn head.